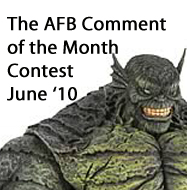 The AFB Comment of the Month Contest for June 2010! First off, thanks to everyone who commented on last month’s blog posts. Congratulations to "chrismandesign" for being our randomly selected winner! Please get in touch with me – probably easiest to do so through the AFB Forum – just log in and message me (“Andy”). Once we hear from chrisman, his choice of either the Blackest Night Wonder Woman or DCUC Wave 13 Donna Troy will be on the way when available from Mike’s Comics N’ Stuff. 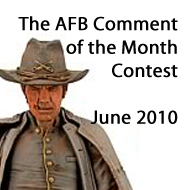 Now to June’s Contest: on offer are two great prizes, either the Marvel Select Abomination from DST or the Jonah Hex Movie Figure from NECA. Two great prizes, both of which I'm looking forward to adding to my own collection! And oooh the june picks are sweet. Way to go Chris! 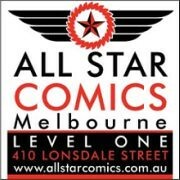 Don't be a stranger, drop into the forum and say 'hi'! They should have gone with Tommy Lee Jones as Jonah Hex. Would have saved a fortune on make-up. That's an awesome win Chrisman. Hopefully we get another hapopy and deserving winner this month. woohooo jonah Hex!! I met the Tony De Zuniga co creator of J Hex last year! Awesome!